I have been in a Frittata Frenzy as of late….using up summer’s bounty of greens and veggies and throwing in scraps of cheese to make easy delicious portable food for picnics, potlucks, brunch luand any meal in between. Here is one easy and adaptable recipe I love from my neighbor the great Alice Waters. I like to cook the frittata on the stove top until the bottom is set and then finish it in the oven but here she cook the whole thing on the stove top. Don’t forget to try ANY cooked veggies as a filling and get creative with other spices, cheeses etc that you can add in. Cut the stems into 1/4-inch slices. Coarsely chop the leaves. Cook for 5 minutes and add the chard stems. Season with salt. Beat lightly. Gently squeeze the chard with your hands, wringing out most, but not all, of the liquid. 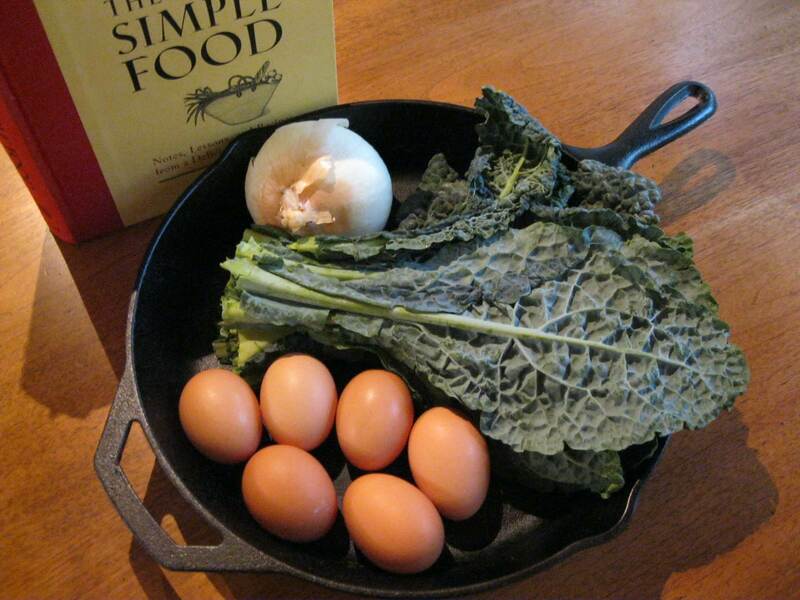 Stir the chard into the beaten eggs. After a few seconds, pour in the egg mixture. As the eggs set on the bottom, lift the edges to allow the uncooked egg to flow underneath.